Republican presidential candidate, retired neurosurgeon Ben Carson answers a question during a Republican presidential primary debate hosted by ABC News at the St. Anselm College Saturday, Feb. 6, 2016, in Manchester, N.H.
Ben Carson said President Obama was "raised white" and can't understand the African-American experience the way he can, according to a Politico podcast published Tuesday. "He's an 'African' American. 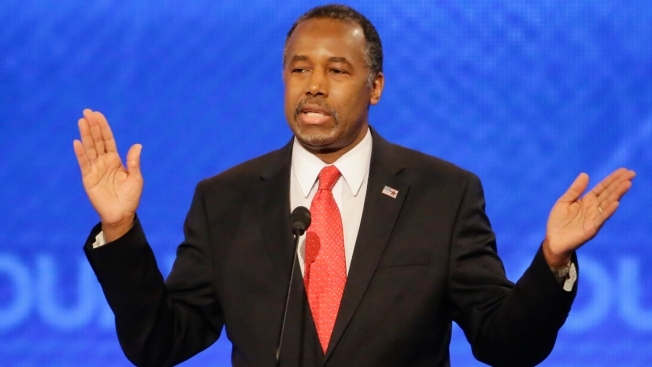 He was, you know, raised white," Carson said in the interview. "I mean, like most Americans, I was proud that we broke the color barrier when he was elected, but … he didn't grow up like I grew up … Many of his formative years were spent in Indonesia. So, for him to, you know, claim that, you know, he identifies with the experience of black Americans, I think, is a bit of a stretch." Carson, who has been polling at the bottom of the GOP pack, long dismissed questions about race as divisive and downplayed his own race. But recently, he's been running ads against affirmative action in South Carolina and condemning black crime as "a crisis" that only he knows how to tackle.